It is difficult to make this dish look appetising as this photo demonstrates. When you work in an office with a high percentage of women (as I have done) you often have to listen to tedious conversations about dieting. And many times I have overheard diet bores slapping themselves on the back because they have had “just a little bit of quiche and salad” for lunch. This is pretty funny because there are few dishes which contain quite so much fat (pastry, eggs, bacon, cream!!!). But for some reason quiche seems to retain an image of ‘lightness’ and ‘femininity’. Calories aside, I have never bee a fan of quiche because I think eggs and cheese mixed together is the devil’s work. Even the smell makes me want to vomit. And memories of being forced to eat my primary school’s ghastly ‘cheese and egg flan’ have never quite left me. I recently read however that a classic Quiche Lorraine should never have cheese in it (yes, yes, it was Elizabeth David again but I’m not obsessed, honest). Hurrah I thought and quickly googled for a recipe without cheese. The filling for this recipe is very straight forward and comes from Felicity Cloake (attempting to create the ‘perfect’ quiche Lorraine for the Guardian). The shortcrust pastry recipe is from my trusty Be-Ro book. I couldn’t help myself and added a little caramelised onion to the mix – but this is not ‘the done thing’ – Elizabeth would not approve. I found that I could happily eat quiche made this way. And my husband, who has a very feminine palate, (he loves cappuccinos, chocolate and yoghurt) thought it was wonderful. To make the pastry measure the flour and salt into a large mixing bowl. Add the margarine and then rub together with the flour until you have a mix the consistency of fine breadcrumbs. Sprinkle over the 3 tablespoons of milk and with a knife stir until well incorporated. Then, using your hands, bring the mixture together lightly to form a ball. Knead very gently a couple of times until smooth. Press the ball down roughly to form a thick flat circle, place in a plastic bag and allow to rest in the fridge for 30 minutes. Heat the oven to 190oC. Remove the pastry from the fridge and roll out with a rolling pin until it is big enough to line a 23 cm tart tin. Prick the bottom with a fork all over and trim the edges. You need to make sure there are no cracks in your pastry (because otherwise the filling will seep out) but if you have some don’t worry – just patch up the holes/cracks with pastry left over from trimming the edges. Don’t worry if it looks a bit messy. Put a square of baking parchment over the surface of the pastry and fill with baking beads. Bake the pastry case in the oven for 10 minutes. Remove the beads and the baking paper and return to the oven for a further 5 minutes. Finally brush the bottom with a thin layer of egg white (apparently this helps to avoid a soggy bottom) and pop back in the oven for another 3 minutes. Set the case aside while you prepare the filling. OPTIONAL: Fry a large onion (or two smaller ones) gently in a little olive oil or butter for about 15 minutes until soft and caramelised. Spread over the base. Fry the bacon until browned but not too crisp. Drain on kitchen towel and spread half over the onion or (if you’re not using onion) over the base. Put the cream and the eggs and yolks into a large bowl with a generous pinch of salt and some pepper. Beat together slowly until combined and then give the mix a fast whisk until frothy. Pour over the base to fill and then sprinkle over the rest of the bacon. Bake for 20 minutes. The centre should still be a little bit wobbly if you like a creamy texture. If you prefer a denser texture then cook for 5-10 minutes longer. Serve warm or at room temperature (but not piping hot or fridge cold – both of these dampen down the flavour). This recipe sounds a bit weird but I promise you it’s absolutely delicious. The first time I made it I had a rather strange conversation via twitter with the writer Diana Henry. @DianaHenryFood Help please! Part way through your pasta with onions recipe but have realised I forgot to buy dill. What else could I use? @DianaHenryFood PS. I also realise that this is a long shot – sure you have much better things to do on a Thursday night. I’ll go away now. @Shelton_Zoe is that the Turkish one? @DianaHenryFood Yes. Thanks for the reply (couldn’t fit the whole title in). 5 minutes from serving up. @DianaHenryFood amazing dish even without dill – thanks for the recipe. I’ll try thyme next as it’s in my garden. @DianaHenryFood Yes, of course. Golden rule – always follow the original recipe exactly first BEFORE tinkering. I’ll leave you in peace now. I hasten to add that the next time I cooked this dish I bought dill. It was nice without, but even nicer with. It was kind of Diana Henry to answer my stupid question but why on earth was she on twitter on a Thursday evening? But then again why was I? Put the onions in a heavy-based pan with the olive oil, bay and cinnamon. Cook over a medium heat, stirring the onions, until they start to turn golden. Then add the garlic and cook for a further two minutes. Add a splash of water, cover the pan, turn the heat right down and leave until the onions are almost caramelised (about 35 minutes). Open the lid to check them every so often and add a little more water if they look dry. When the onions are cooked, uncover, season with salt and pepper and boil away any excess liquid. Cook the tagliatelle according to the packet instructions. Drain and toss it into the pot with the onions and stir in the yogurt, milk and dill. Very quickly melt the butter in a small saucepan and add the cayenne. Cook for about 20 seconds. Serve the pasta with the spiced butter drizzled on top (and, if you like, the feta on the side). Here are two recipes for things to eat with holes in the middle. There is no other reason for putting them in the same blog post except that they’re both fun to make. One day I’ll try making doughnuts. 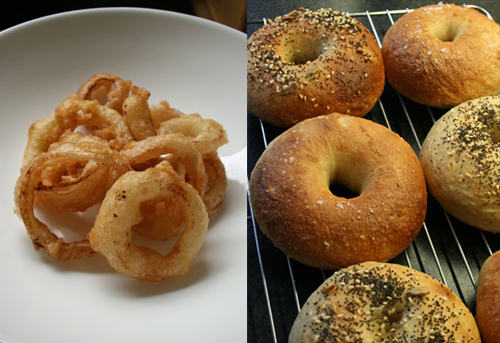 I’ve tried several recipes for onion rings but for me this one is the simplest and the best. Peel and cut your onion into slices just under 1 cm thick (8mm). Separate into rings and discard the two tiny ones in the centre (you can save these for another use). Measure the flour and salt into a mixing bowl and add the sparkling water gradually until you have a batter the consistency of double cream. Now heat your oil. It’s best if you use a large saucepan and fill to about half way. The oil is ready for frying when a tiny drop of batter hisses immediately on entering the pan. Put your onion rings into the batter and shake them a little to remove any excess batter before carefully dropping them into the oil. You can fry 4 or 5 at a time, or more if you’re short of time and you don’t mind if they stick together a bit. Fry for 2-3 minutes until golden brown. Drain well on kitchen paper and sprinkle with salt (optional if you don’t like to eat too much salt) before serving. This is a basic recipe and I’m sure bread experts will scoff but the result is a very respectable bagel which is much nicer than the dry old ones you can buy at Tesco Express. These make a perfect Sunday brunch with scrambled eggs and chorizo or smoked salmon and cream cheese. For fresh bagels in the morning start the process in the evening. Take a large mixing bowl and measure out the flour, yeast, salt and caster sugar. Tip in the water and stir into a firm dough with your hands. Now divide the dough into 6 equal portions and shape into balls, place on a tray, cover with a cloth and leave for another 20 minutes. Now shape your bagels. Make a hole in the middle with the end of a wooden spoon and then stretch the dough outwards with your fingers. The hole needs to be quite large (about 4 cm) as it will close up as it cooks. Cover a chopping board or tray with lightly oiled cling film then place the bagels on the tray and cover loosely with another piece of lightly oiled cling film. Place in the fridge to rise slowly overnight. In the morning preheat the oven to 200oC fan. Take a large pan and boil some water with 2 tablespoons of brown sugar added. Drop each bagel into the boiling water and poach for just 5 seconds on each side. Place the poached bagels on an oiled baking tray, sprinkle with seeds or salt and bake for 15-20 minutes. This is one of the savoury dishes that I first learnt to cook (spaghetti bolognese being the obvious other). My home economics teacher was so surprised that I even knew what lentils were, let alone how to cook them, that she gave me a special achievement award at the end of term! 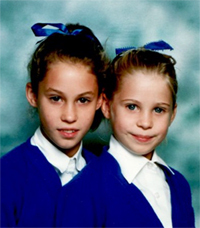 That was the kind of school I went to – learning to spell was less important. It was actually quite a challenge to write this recipe down because I cook it from instinct. I’ve listed the ingredients in terms of what is essential and what is optional, just in case you don’t have any of the later in your cupboard. This is because dhal is an excellent standby for when you’ve not had a chance to go shopping, or when you’re on a really tight budget, and I don’t want to put you off making it just because you don’t have one of the spices or some fresh coriander. This is another recipe for my daughter Elizabeth who has been eating dhal with gusto since she was 4 months old. Begin by cooking the lentils. I like to rinse them first (I find this reduces their wind inducing capacity). Put them in a medium size pan and top with cold water. Swirl the water around with your hands and then drain. Do this about 3 times or until the water is a lot less cloudy when you swirl. Add the ½ litre of cold water to the pan and bring to the boil. Simmer on a low heat until the lentils are soft and have absorbed most of the water (this should take about 30 minutes), you don’t need to drain them. Add the tomatoes (if using) in the last 5 minutes of cooking. In a pestle and mortar crush the garlic with the salt and dry spices (turmeric, ground cumin and ground coriander). Heat half the ghee in a frying pan until smoking hot. Add the onions and fry until well coloured. Then add the dry spices and garlic and cook for a couple of minutes stirring well. Finally, add the remaining ghee and when the mix is really hot add to the lentils. Stir until everything is well mixed and check the seasoning. Add most of the chopped coriander and then ladle into bowls. 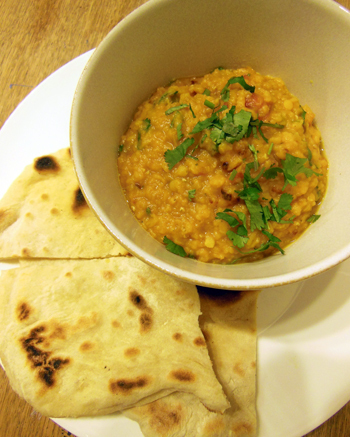 Garnish with the remaining coriander and serve with a naan style flat bread (as below) or rice. NOTE: You can cook the lentils in advance but it’s best not to add the hot spice and ghee mix until just before serving. This is because lentils have a strange quality that absorbs all flavour and dulls it down so you’ll just end up having to add more salt and spices later to get the taste back. I’ve tried several different recipes for naan and they have all come out tasting like a dry flat scone –just not right at all. Bizarrely the recipe below is the most naan-like even though it’s just a regular bread mix rolled flat and cooked in a dry frying pan. Because of the addition of yeast the texture is lovely and soft. You could brush them with ghee once cooked if you wanted a more authentic taste. 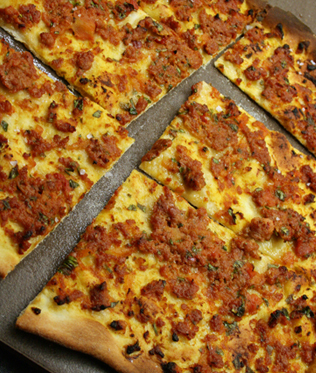 Mix together all the dry ingredients then add the water a little at a time until the mix comes together in a soft dough. Knead for 10 minutes until the dough is nice and elastic. Cover and set aside to prove for at least an hour (although 2 is better). Divide the dough into four portions and roll each out with a rolling pin to form a thin disc. You will need to flour your work surface and pin liberally to stop the dough from sticking. Heat a frying pan until it is very hot and then cook the flat bread for about 4 minutes on each side until golden. Don’t worry if it catches a little and don’t add any oil to the pan. Once cooked keep warm under a tea towel while you continue the process with the remaining three portions. NOTE: I find that using an old frying pan where the non-stick has come off works a treat for flat breads.